You will earn 3,852 Reward Points. Earn 1 reward point for every 1 dollar spent. Weather resistant stainless steel construction. Stylish feathered jewel finish on bar top hides scratches. 6-gallon plastic drain tank with on-off valve to collect melting ice water from cocktail bin. Six 4" heavy-duty rubberized casters. The two bartender side corner casters are locking. 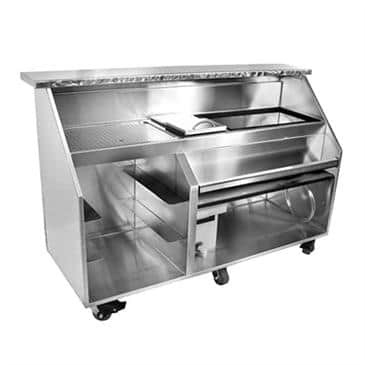 Stainless steel front and side panels are welded to the 16-gauge stainless steel base for incredible durability. Stainless steel bar top and front and side panels have a plastic honey comb core for durability and sound deadening. Stainless steel bottle rail with PVC plastic sound deadening cover. Rails include a clear snap-on liquor identification label cover. Foamed-in-place insulation and a PVC plastic breaker strip around ice bin liners to prevent thermal transfer from outside the ice bin so ice lasts longer. Cocktail ice bin with sliding cover and condiment cup area. Rear condiment area has hinged stainless steel sanitary cover with three (12") or four (18") cups. Iced beverage storage bin with separate drain to prevent contamination of ice used to make cocktails. Drain includes flexible hose and on/off valve for draining when convenient.